In 2003, the Texas legislature passed changes to the statutes expanding the reasons a parent can claim an exemption from vaccinations. The Texas Department of State Health Services (DSHS) outlines specific procedures for requesting an official affidavit and submitting it to the school and for completing a medical exemption. It is our hope that this page will answer your questions about the process. How do I get an exemption for reasons of conscience, including a religious belief? By hand-delivery at the department’s physical address at 1100 West 49th Street, Austin, TX 78756. In-person requests can be made between 8am and 5pm Mondays through Fridays. Your affidavit forms for hand-delivered requests will be mailed to you via U.S. Postal Service. Please note: telephone and email requests are not processed. What information do I need to request an exemption? * The state allows you to request a maximum of five forms per individual per request. We recommend that you request the maximum (five) per child. Exemption forms can be used for and may be needed at multiple locations and an original copy must be relinquished to each organization. Having extras on hand will prevent any delay in enrollment if a need for a form should arise. Clarifying Note: You may request up to 5 forms per child each time you request. There is not a limit to the number of times you may request forms. I requested an affidavit. Is the state now tracking my family? DSHS does not maintain a record of the names of individuals who request an affidavit and returns the original request (where applicable) with the forms requested. DSHS does report on the number of affidavit requests and zip code but no identifying information is maintained. I have my affidavit/s. Now what? 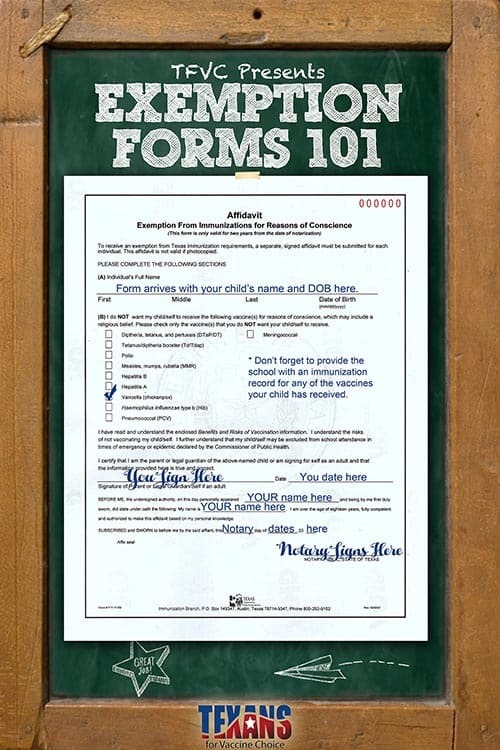 When a facility requires the affidavit, go get one form per child notarized. Do not sign your form until you are in front of the notary. Confirm that the facility requires an exemption form before you get your form notarize. Once notarized, the form must be turned in to the requesting facility within 90 days or it will become void. Once turned in to the requesting facility, the form is valid for 2 years. Texas schools will accept only the official DSHS affidavit forms. No other forms, photocopies or reproductions are valid. Any child who utilizes the affidavit may be excluded from school in times of emergency or epidemic declared by the commissioner of public health. Do all K-12 schools have to accept the exemption form? Texas public schools, including charter schools, are required to accept the exemption form. Private schools that accept state funding of any kind must also accept the exemption form. Do all childcare facilities/preschools have to accept the exemption form? Current state law requires that childcare facilities and preschools that are licensed by the Texas Department of Family and Protective Services (DFPS) to accept the exemption form. However, TFVC has received reports from members across the state that some facilities are choosing not to abide by this law and instead are denying exemptions. Your best option is to fully vet a facility, either with a phone call or web page search, on their policies before enrollment or paying any sort of deposit or other fees. Does provisional enrollment in school apply to vaccinations? Four vaccination-related provisional enrollment scenarios exist. All four scenarios allow for a 30 day temporary enrollment if vaccination evidence is not available. After 30 days, the school nurse/administrator will review the student’s vaccination status. a student who has received at least one dose of each specified age-appropriate vaccine required, and is on schedule to receive subsequent doses as rapidly as medically feasible. The student must not be overdue for next dose in series to be considered provisional. How do I enroll my child if I am selectively/delayed vaccinating? In this instance, two different documents will be needed. 1- the official notarized affidavit indicating which vaccine/s the parent has chosen to forego, and 2- a valid immunization record indicating the date of administration of each chosen vaccine with appropriate validation by a physician. To claim an exemption for medical reasons, the child or student must present a statement signed by the child’s physician (M.D. or D.O. ), duly registered and licensed to practice medicine in the United States who has examined the child. The statement must express that, in the physician’s opinion, the vaccine required is medically contraindicated or poses a significant risk to the health and well-being of the child or any member of the child’s household. Unless it is written in the statement that a lifelong condition exists (the lifelong condition does not have to be named), the exemption statement is valid for only one year from the date signed by the physician. Are titers accepted as exceptions to immunization requirements? Serologic confirmations of immunity (ie titers) to measles, rubella, mumps, hepatitis A, hepatitis B, and/or varicella are acceptable. Evidence of measles, rubella, mumps, hepatitis A, or hepatitis B, and/or varicella illnesses must consist of a valid laboratory report that indicates confirmation of either immunity or infection. For varicella (chickenpox), a written statement from a parent or guardian, school nurse, or physician attesting to a student’s positive history of varicella disease or of varicella immunity, is acceptable in lieu of a vaccine record for that disease (see form at http://www.dshs.state.tx.us/immunize/docs/c-9.pdf). Are vaccination requirements different for active-duty military? Persons who can prove that they are serving on active duty with the armed forces of the United States are exempt from vaccination requirements. Armed forces exclusions apply to active-duty military only. Dependents of service members are not excluded from Texas vaccination requirements. What if my child changes schools? The affidavit is part of the child’s school records and should be sent to the new school with other school records. Can an expectant parent request an exemption affidavit form for an unborn child? No. The child’s name and date of birth is required when the exemption affidavit form is requested. Expectant parents must wait until after the child is born to request the vaccine exemption affidavit form. What is ImmTrac and how do I remove myself/my children? ImmTrac, the Texas Immunization Registry, is a no-cost service offered by the Texas Department of State Health Services (DSHS). ImmTrac stores immunization information from multiple sources electronically in one centralized system. Texas law requires written consent for ImmTrac participation and limits access to the registry to only those individuals who have been authorized by law. Each participant’s immunization information is consolidated into one electronic record. You can remove yourself and your children from ImmTrac by using the ImmTrac Withdrawal Form/Withdrawal of Consent and Confirmation Form. Download, print, fill out and mail a form for each person you wish to remove. If you do not wish to have your newborn participate in ImmTrac, you can deny your baby’s registration by marking “I DENY consent for registration.” on the ImmTrac Newborn Registration Form provided by the birth registrar at the hospital. Despite the fact that ImmTrac is an opt-in (consent required) immunization registry system, we consistently receive reports from individuals that they or their children have been added to this tracking system without their consent. The number of reports we are receiving has recently skyrocketed, and we are hearing from people who not only denied consent in writing on the state’s consent form but also from people who never even saw a consent form. To find out if you are in the ImmTrac system, you can call the DSHS at (800) 252-9152. Texas law requires DSHS to keep record of these complaints and to report them to the Governor & House of Representatives by September of every even-numbered year. The last report claimed that no complaints had been received, which was surprising to us considering the number of complaints TFVC receives from Texas citizens. You can find more ways to file a complaint and more information on the complaint-reporting process here. What about the meningitis vaccination to live on campus at college? If you are enrolling in a public junior college or a community college, you can create your own exemption form using this website: https://corequestjc.dshs.texas.gov/. After entering all the requested information, print the form, sign and date it, and submit the form when registering for courses. Some public junior colleges and community colleges may require students to use this option. If you are enrolling in any public or private four-year college, university, or other institution of higher education, you can submit an exemption affidavit for meningococcal vaccination by requesting the official Texas DSHS affidavit form by following the steps outlined above. I work in a childcare facility. Can I be exempt? All DFPS-licensed childcare facilities must have a policy that includes procedures for a facility employee to be exempt from the required vaccines for both medical reasons and reasons of conscience, including a religious belief. If you choose to be exempt, you may be required to use protective equipment such as gloves or masks. Source: Human Resources Code, Title 2, Subtitle D, Chapter 42, Subchapter A, Section 42.04305. I am enrolling in a health-related field in college. Can I be exempt? Students enrolled in (non-veterinary) health-related, higher education courses which will involve direct patient contact with potential exposure to blood or bodily fluids can be exempt from the immunization requirements if the student can properly demonstrate proof of serological confirmation (ie titers) of immunity. Serologic confirmations (via a valid laboratory report that indicates confirmation of either immunity or infection) to measles, rubella, mumps, hepatitis A, hepatitis B, or varicella, are acceptable. Varicella can also be confirmed via a written statement from a parent/guardian, school nurse, or physician attesting to the student’s positive history of varicella. My child has been admitted to a state-run facility. Can he/she still be exempt? Any child admitted to a facility of the Department of Aging and Disability Services, Department of State Health Services, the Texas Department of Criminal Justice, or the Texas Youth Commission is eligible for any of the vaccination exemptions. I work or live in a nursing home. Can I refuse vaccinations? Licensed nursing homes that serve elderly residents offer vaccines for both pneumococcal and influenza. Residents have the right to refuse either or both. Additionally, employees of these facilities also have the right to refuse the influenza vaccine. Tell me more about the Hepatitis B vaccine given to newborns. In 1991, the American Academy of Pediatrics recommended that all newborns be given a Hepatitis B shot within 12 hours of birth. However, there is no legal federal or state requirement in the U.S. or Texas that newborns receive a Hepatitis B shot at birth. While none of the below information should be construed as legal advice, we hope to help you navigate refusing this vaccine if that is your desire. Many private medical facilities have their own internal policies in place, which direct staff to routinely give newborn infants a Hepatitis B shot before discharge. Private hospitals and birthing facilities have a legal right to refuse to allow you to give birth in their medical facility if you do not agree to abide by their policies in advance. Therefore, if you do not want your newborn to get a Hepatitis B shot at birth, you should evaluate your birthing options well in advance of your due date to find a location that has a more flexible policy about allowing exceptions to this vaccine. Newborn vaccination policies may be hard to find because they are often included under “Standard of Care” language in policy manuals. Additionally, many hospitals and birthing centers, as a routine matter, administer the Hepatitis B vaccine on the basis of what is known as “standing orders”. Find a pediatrician who respects your choice to delay or forego this vaccination and ask him/her to write the “standing orders” for your baby accordingly. You may ask for copies to share with the hospital or birthing center at the time of admission for labor and delivery. Please carefully read all your admission paperwork. If you wish to decline a newborn vaccination, be sure to review all hospital forms, policies and procedures before signing. You might also want to consider a written birthing plan and newborn care plan that includes the understanding by staff that no Hepatitis B vaccine should be given to your newborn before discharge. It is also a good idea to keep your newborn with you at all times in the hospital, or have a trusted family member stay with your infant while you are napping, to ensure that your baby is not vaccinated without your knowledge or consent before discharge. If you find yourself being threatened by hospital staff with charges of child neglect or abuse for not giving your child this vaccine, immediately find an attorney who can advise you about whether or not your parental rights are being violated and evaluate your legal options.